Get ready for double the X Factor and double the fun this February as Marcus Collins joins fellow X-contestant Lloyd Daniels in Joseph and the Amazing Technicolour Dreamcoat at the Edinburgh Playhouse from 17 – 21 February 2015. Marcus Collins, who was mentored by Take That star Gary Barlow, finished as runner-up on The X Factor 2011, pipped to the post by winners Little Mix. 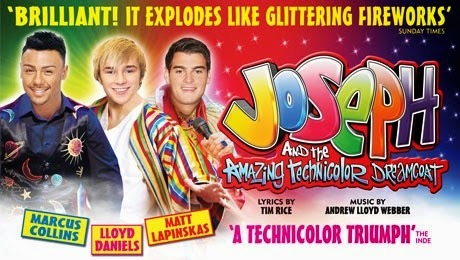 After a successful 2014 tour wowing the crowds across the UK with his musical theatre debut, Lloyd Daniels reprises his role as Joseph for the 2015 tour. The show also sees the welcome return of Matt Lapinskas who will be donning his Elvis outfit once more to reprise the role of the Pharaoh. Best known for playing Anthony Moon in BBC EastEnders, Matt was also runner up in the penultimate series of Dancing on Ice. He joined the Joseph cast in 2014 for the UK, making his first musical theatre role. This colourful retelling of the biblical story about Joseph, his eleven brothers and the coat of many colours sings out to young and old alike with a score which is crammed wall to wall with hits – including Jacob and Sons, Close Every Door and Any Dream Will Do. Catch it while you can.